Rolex SA was founded in 1905 by the German Hans Wilsdorf and his brother-in-law, Alfred Davis. Contrary to popular belief, Hans Wilsdorf was neither Swiss, nor a watchmaker. Wilsdorf & Davis was the original name of what later became the Rolex Watch Company. They originally imported Hermann Aegler's Swiss movements to England and placed them in quality cases made by Dennison and others. These early wristwatches were then sold to jewellers, who then put their own names on the dial. The earliest watches from the firm of Wilsdorf and Davis are usually marked "W&D" – inside the caseback only.Hans Wilsdorf registered the trademark name "Automatic Rolex Watches" in La Chaux-de-Fonds, Switzerland during 1908. The word was made up, but its origin is obscure. One story, which was never confirmed by Wilsdorf, is that the word "Rolex" came from the French phrase horlogerie exquise, meaning exquisite watch industry. The Wilsdorf & Davis company moved out of Great Britain in 1912. Wilsdorf wanted his watches to be affordable, but taxes and export duties on the case metals (silver and gold) were driving costs up. 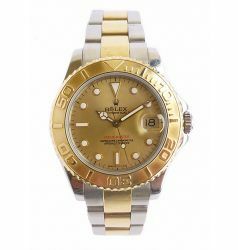 From that time to the present, Automatic Rolex Watches has been headquartered in Geneva, Switzerland, though the company owns facilities in other cities (Bienne, etc) and continents (North America, Asia, Australia, etc). The company name Automatic Rolex Watches was officially registered on 15 November 1915. It is thought this change was part of a drive to popularize wristwatches, which at the time were still considered a novelty largely for women (pocket watches were more common). Wilsdorf was said to desire his watch brand's name to be easily pronounceable in any language. The company name was officially changed to the Rolex Watch Company during 1919. It was later changed to Montres Rolex, SA and finally Rolex, SA.Rolex SA is a foundation initiated and originally funded by Hans Wilsdorf and the Aegler family. According to foundation documentation, the Rolex SA company can never be sold, nor traded on any stock market.